Pr e s by te r i a n s To d ay | OCTOBER/NOVEMBER 2017 37 Held three times a year, each workshop has about 30 to 40 people who come to learn about estate planning, minimizing taxes, and ways they can stretch their chari- table dollars and create a legacy. Annually, the church honors the members of the Living Legacy Fellowship (LLF) at an appreciation dinner. The LLF includes people who have arranged bequests or planned other special gifts. The church has received gifts to create permanent endowments, unrestricted funds for session distribution and scholarships for youth. The endowments help fund adult mission trips, retire debt, feed hungry people within the local area and support many other ministries. But Gaithersburg doesn't do it alone. 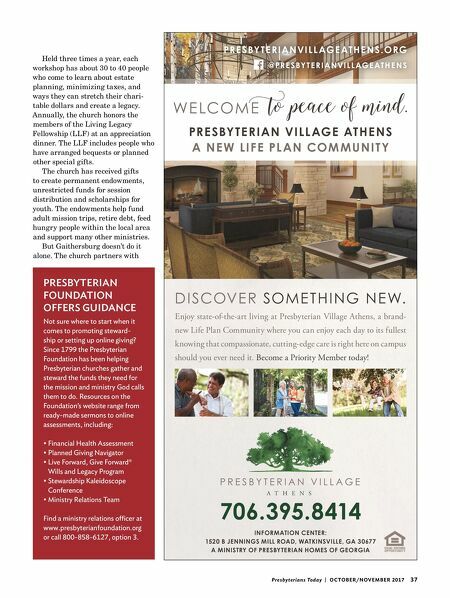 The church partners with 706.395.8414 INFORMATION CENTER: 1520 B JENNINGS MILL ROAD, WATKINSVILLE, GA 30677 A MINISTRY OF PRESBYTERIAN HOMES OF GEORGIA Enjoy state-of-the-art living at Presbyterian Village Athens, a brand- new Life Plan Community where you can enjoy each day to its fullest knowing that compassionate, cutting-edge care is right here on campus should you ever need it. Become a Priority Member today! D I SCOVE R SOM E T H I N G N E W. PRE SBY TE R IAN VI LL AGE ATH E N S A N E W LI F E PL AN COM MU N I T Y PR E S BY T E R I A N V I L L AG E AT H E N S .O R G @ P R E S BY T E R I A N V I L L AG E AT H E N S PRESBYTERIAN FOUNDATION OFFERS GUIDANCE Not sure where to start when it comes to promoting steward- ship or setting up online giving? 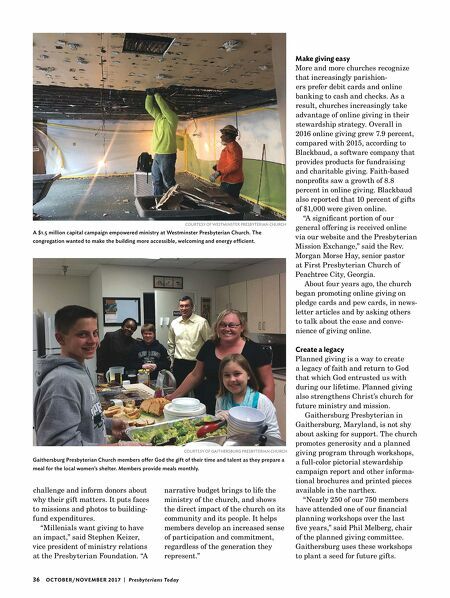 Since 1799 the Presbyterian Foundation has been helping Presbyterian churches gather and steward the funds they need for the mission and ministry God calls them to do. Resources on the Foundation's website range from ready-made sermons to online assessments, including: • Financial Health Assessment • Planned Giving Navigator • Live Forward, Give Forward® Wills and Legacy Program • Stewardship Kaleidoscope Conference • Ministry Relations Team Find a ministry relations officer at www.presbyterianfoundation.org or call 800-858-6127, option 3.